According to a report in the Wall Street Journal, Verizon has been unable to purchase as many iPhones as stipulated in its contract with Apple. Apple typically requires carriers to agree to a certain level of carrier subsidy and a minimum order quantity (MOQ). If the carrier is unable to meet the commitments, they would be required to pay a penalty, which in this case may be as high as $12-$14 billion. 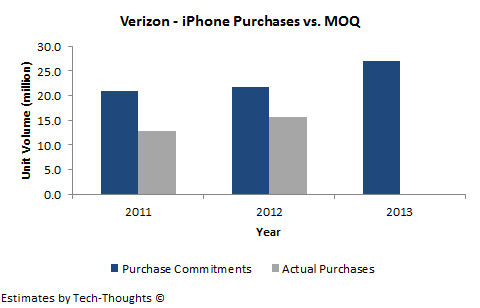 The chart above shows Verizon's purchase commitments and actual purchases based on the financial data from the report and the iPhone's ASP in that year. As we can clearly see, actual purchases have lagged commitments by a substantial amount and the aggregated commitments for 2013 far exceed any rational purchase expectation (4 million in Q1). According to Bloomberg, Verizon's shortfall is worth $4-$5 per share and is likely to trigger an immediate response from Verizon regarding a renegotiation of these purchase commitments. This puts Apple in an awkward situation as it is very likely that numerous carriers around the world are in a similar situation. Apple cannot risk alienating Verizon, as it is one of the largest iPhone sellers in the world. This is likely to evoke similar renegotiation requests from other carriers. Any renegotiation is likely to focus on either the subsidy amount paid per phone or the minimum order quantity itself. A lower subsidy amount will hit Apple's financials directly as the iPhone generates over half of its revenues. Alternatively, lowering the MOQ would also reduce potential revenues, but it would also reduce the marketing support the iPhone receives from carriers. If the carriers aren't subject to draconian MOQ limits, they are likely to market devices with lower subsidies to high-end consumers, which would speed up the onset of the profit share trap. As I had predicted, Apple may have painted itself into a corner with respect to carriers.